A professor in a university may make an important discovery in his or her field. If such individual does not make that discovery, someone else probably will. Thus, nothing is really lost. A professor in a classroom, however, sets a scene for different opportunities. Any class of course has its share of strongly prepared as well as weak students. With or without the professor, the strong students are still very much likely to thrive. A professor, however, may still provide an experience that is both interesting and challenging to these advanced students. For the weak students, the professor may just be the source of inspiration and motivation. Inside the classroom, a professor truly has an opportunity to touch the lives of students by nurturing and inspiring them. fixed mindset: People believe their basic qualities, like their intelligence or talent, are simply fixed traits. They spend their time documenting their intelligence or talent instead of developing them. They also believe that talent alone creates success—without effort. They’re wrong. growth mindset: People believe that their most basic abilities can be developed through dedication and hard work—brains and talent are just the starting point. This view creates a love of learning and a resilience that is essential for great accomplishment. Virtually all great people have had these qualities. 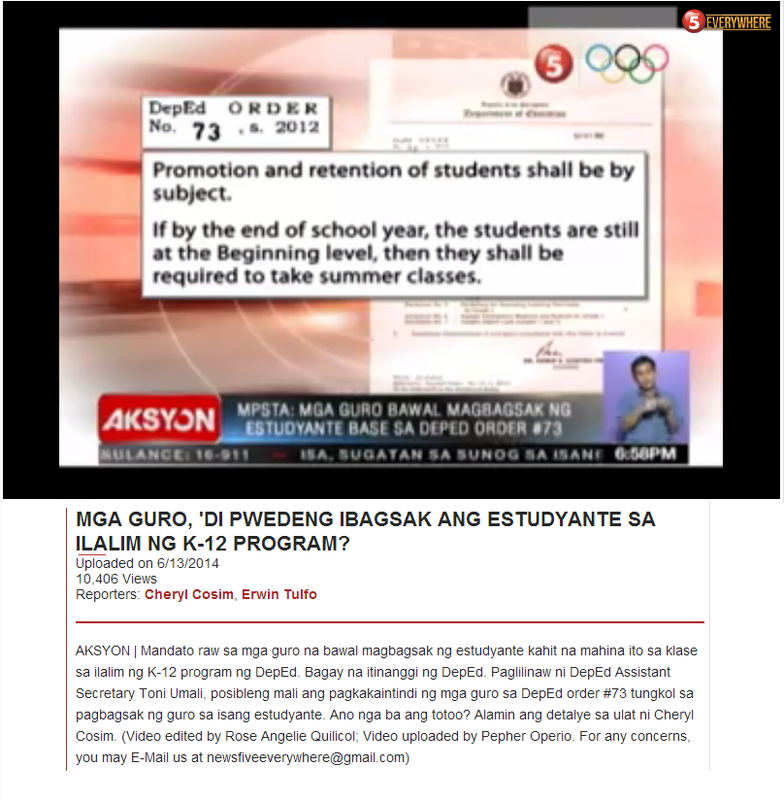 "...particularly in East Asia, they give a great value to education. They attract great people into the teaching profession. They attract the most talented teachers into the most challenging classrooms, something the U.S. has great difficulties with. I mean, every student believes that they are the owners of their success, that investment in learning, effort is going to make a difference, not talent." The provinces of China, Vietnam and Singapore have more than 15 percent of its students classified as resilient. Of course, with Macao, Hong Kong, and Singapore, this perhaps is quite insignificant since its bottom quarter is wealthier than the upper quarter in poor countries like Vietnam. The gross domestic product at purchasing power parity per capita (GDP-PPP) of Macao, Hong Kong and Singapore are: (in US$) 80000, 52000 and 62000, respectively. Even Shanghai has a GDP-PPP at US$ 20000. Vietnam, on the other hand, only has US$ 3600. This is even lower than that of the Philippines which has a GDP-PPP at US$ 4400. The Philippines can therefore easily relate to how poor the bottom quarter really is in a country like Vietnam. For this reason, Vietnam is indeed a true gem in this criterion, since 17/25 or seventy percent of its poorest of the poor children perform as well as the best students across the globe. Targeting disadvantaged children means focusing on equity in education. Oftentimes, schools reflect society. Although education is usually heralded as a vehicle for social mobility, this is often a dream and not a reality. Most of the times, schools simply maintain the status quo. Children from wealthy families are able to attend good schools while children from poor households generally have to settle with poor quality education. As a result, inequality in society is simply copied to an inequality in education. 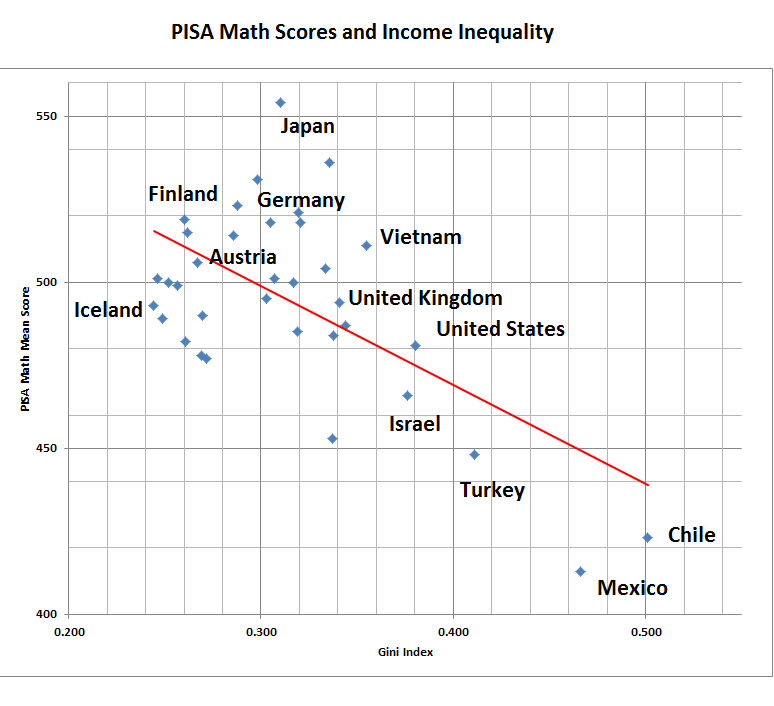 What is interesting to note is that the scores in PISA correlate with income inequality. Students from countries where wealth is more equally distributed score higher. The following is a graph of the PISA math score of a country plotted against the Gini coefficient. (The Gini coefficient is a number between 0 and 1, where 0 corresponds with perfect equality (where everyone has the same income) and 1 corresponds with perfect inequality (where one person has all the income—and everyone else has zero income) - Wikipedia). 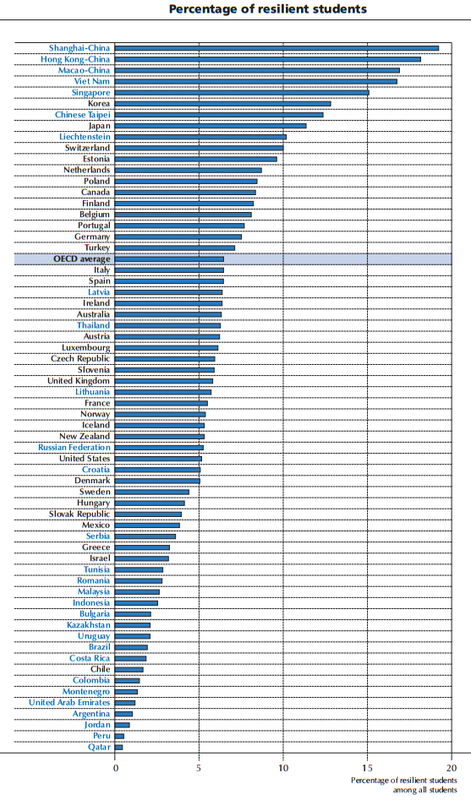 Only the member countries of OECD are included in the graph shown above. 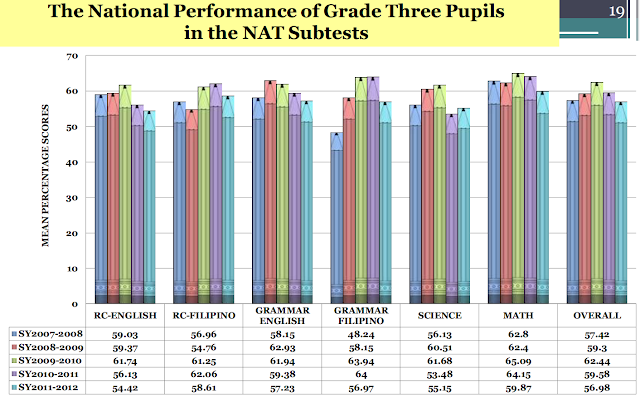 This graph indeed shows that excellence comes with equity.